"People have been working on the assumption that these planets are layered because it's easier to work on this assumption," said Hugh Wilson, a planetary scientist at the University of California Berkeley and a coauthor of the new research appearing in Physical Review Letters. Those conditions are thought to be underestimates of the actual conditions inside Jupiters core. 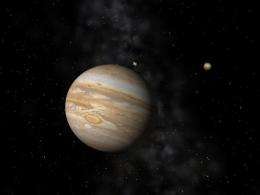 Nonetheless, the authors found that magnesium oxide -- an important compound likely found in Jupiter's core -- would liquefy and begin drifting into Jupiter's fluid upper envelope under these relatively tame conditions. Called CoRoT-20b, the new planet was announced in February, and its discoverers searched for a suitable explanation for its unusual density. Using conventional models, the astronomers calculated that the core would have to make up over half of the planet. For comparison, Jupiter's core only represents about between 3-15 percent of the planets total mass. "It's much easier to explain the composition of this planet under a model where you have a mixed interior," said Wilson. Even the team that discovered the planet noted that a mixing model could allow for a more palatable planet density. Wilson's simulations not only add credence to the mixing model of giant planets but also suggest that this specific exoplanet's core is probably melting just like Jupiter's. This melting may help explain why the exoplanet's heavy elements are likely stirred up and distributed throughout its volume, said Wilson. Liquefied parts of a gas giant's core may have trouble reaching the outer envelope due to double diffusive convection -- a process commonly found in Earth's oceans. When salty water accumulates at the bottom of the ocean, its density keeps it from mixing thoroughly with the upper layers. In a similar fashion, the heavy elements in Jupiter's core may have trouble gaining enough energy to move upward and outward. Damn, it'd be interesting to drop a probe down into Jupiter's atmosphere to see what's really going on down there. But then again, I'm sure that pretty much anything we send there is just going to be torn apart by the giant planet's gravity, and crushed by its thick, turbulent atmosphere. There must be a way to see through those damned clouds. We already have done this. Look up the Galileo mission. Just wondering. I don't think the Galileo mission released any images or details of Jupiter's interior upon its descent. At least, all I heard was that the probe crashed into Jupiter. And that was it. It's hard to find anything else on the probe's final moments. It's a Mixmaster planet. http://en.wikiped...universe . @ Mike Massen: Brown dwarfs may burn deuterium if they are massive enough, giant planets aren't that massive seems like. @ Sinister1822: There was no camera on board, it wouldn't have seen anything lower down. That was perhaps lucky, since Galileo was the mission with the main antenna failure, and the data transmission was a bottleneck. Anyway, there were a lot of instruments that captured ~ 50 minutes and ~ 4 MB of data. Certainly a lot of papers would be analyzing those for model images and details of the interior. (The probe descended some 150 km, sez Wikipedia.) Wikipedia provides an entry point to that, but I assume that there is a Galielo site as well. I just got the notice that my post did not pass the spam filter. I removed the link from your quote and it seemed to work fine without it. Maybe I am just to new here to post links. I thought that the size issue was already well known and that any more massive planet would be smaller due to matter degernacy, shrinking under pressure, continuing on a scale through white dwarfs. A giant exoplanet whose core is over half the mass of the planet is definitely an odd beast in my book. Either heavy elements were in much greater abundance during planetary formation than was the case in our own solar system, or the planet has shed some of its lighter elements after formation. It might be interesting to simulate what happens to the lighter elements during a collision of two giants. What gets ejected? What is retained? How sensitive to collision velocities is the result? Heh. Astronomy is way too much fun to leave to the professionals. Indeed...perhaps, not INTO the gas giant but, THROUGH, it! Two satellites beaming data/transmissions through the planet, looking for timely data flow/energetic-pulse reflections, through a broadband antenna array. They would have to get so close, that they would lose direct contact with each other. But, ELF transmissions could place them in relation to each other and a third probe, at Juno-Synch (Juno, for 'wife' of Jupiter) would relay final data back to earth. I have an idea how to power the beams without harming the data links, or Jupiter. The sats will need SPEED @ such close orbits, but..yes, it can B done.